Despite its significant impact on the lives of seniors, Ontario’s new Retirement Homes Act took a little over 60 days from introduction to passage through the legislature June 2nd. In the rush, only one day of hearings was set aside to listen to citizens concerned about its impact. When OPSEU presented, the committee appeared distracted to the point of MPP Paul Miller having to assure our presenters that the politicians were, in fact, listening. Despite a last ditch effort to encourage MPPs to vote down the bill and take the time to get it right, both the Tories and Liberals voted to pass it this week, with only the NDP casting votes against it. Bill 21 is about saving the government money. Unlike long term care homes, the care in retirement homes is not paid for as part of our Medicare system. The only exception to this is for alternate level of care patients transferred from hospitals. These patients are still effectively covered under the more extensive rules governing nursing homes. Retirement homes were intended to be rental accommodations for seniors who are able to manage and pay for their own care. They are mostly designed for seniors who need minimal to moderate support with their daily living activities. More and more our OPSEU members in these homes are telling us that the level of acuity of these residents is on the rise, requiring much more intensive levels of support they simply cannot provide. Increasingly, those who cannot find a bed in a nursing home are winding up in these facilities. Instead of drawing a line in the sand, the new Retirement Homes Act essentially opens the door to retirement homes becoming a second tier of nursing home care. If you are rich, you can pay for enhanced services and find a bed right away. If you are of more limited means, the financial burden may be crushing and the level of care can be completely inappropriate. We reported here yesterday that the North Simcoe Muskoka Local Health Integration Network has said there are no plans for new nursing home beds in that region despite a 98.8 per cent occupancy rate. Why is that? If seniors are kept on long waiting lists for nursing home beds, cannot get access to adequate home care, and are pressured to leave a hospital anxious about the number of “alternate level of care patients” (ALC) occupying scarce beds, families are more likely to pay for that second tier of accommodation in a retirement home if they have the means. The average total monthly cost is $2,750 for a standard retirement space and $3,440 for a heavy care space. What they get will be a crap shoot. With the new legislation, retirement homes do not face the same level scrutiny nor have the same level of regulation as a government-funded long term care home. According to the Ontario Health Quality Council, wait times for long term care have tripled since 2005. The average wait is 105 days. Those waiting for placement from home are averaging a wait of 173 days – or about six months. The new oversight body created under Bill 21 will not be much help. The Retirement Homes Regulatory Authority is not a government agency, but a third-party primarily made up of major stakeholders in the retirement home industry. Given it will be self-appointing, there is little doubt the group will represent the interests of providers, not consumers. The new legislation may actually backfire on the province. With more than half of the present long term care nursing home beds being provided by for-profit corporations, there will be much incentive to turn these homes into lightly-regulated retirement facilities. 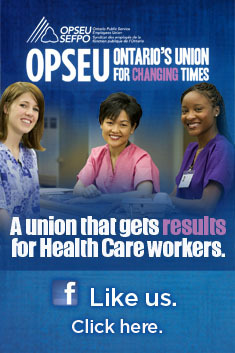 Thank you OPSEU for keeping us all so well informed. Patty Park Cochair Northumberland Hills Health Coalition. Will forward this information to our members.